The information contained in this care sheet is written to the captive care of what is known as the “common” kingsnakes and milk snakes. 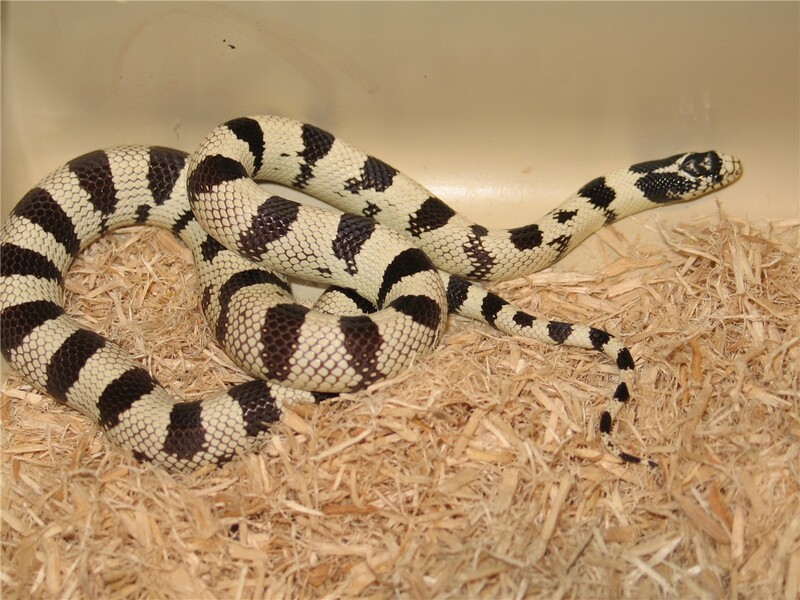 The genus Lampropeltis actually contains many species of snakes, and the captive care of some of these species (for example, the mountain kingsnakes) may be somewhat different than that prescribed for the more commonly kept species. Individuals looking for care sheets on some of these species are advised to consult either books or the Internet for more information. This list is by no means intended as comprehensive, or to imply that the care of other species of kingsnakes or milk snakes may be different. Rather, we are simply attempting to document the most commonly kept species of these snakes – those that are bred readily in captivity and typically offered for sale at pet stores and reptile expos. Overview – Kingsnakes and milk snakes occur naturally throughout North and South America, ranging from southern Canada down through Central America and parts of South America. They can be found in almost any type of habitat – deserts, forests, mountainous regions, etc. They are constrictors, and can usually be found in areas where there is an abundance of their favorite prey, mice. As hatchlings, they can range in size from 6 inches to a foot in length. There is a wide variety in sizes for adult snakes – as small as three feet for the more diminutive species, such as eastern milk snakes, to as long as five feet for some of the larger species, such as eastern kingsnakes or Honduran milk snakes. They come in a wide variety of colors and patterns. Most kingsnakes and milk snakes are cannibalistic (the getula family are more likely to display this tendency) so care should be taken to keep them singly, except for breeding purposes. In fact, California king snakes are known to consume rattlesnakes! 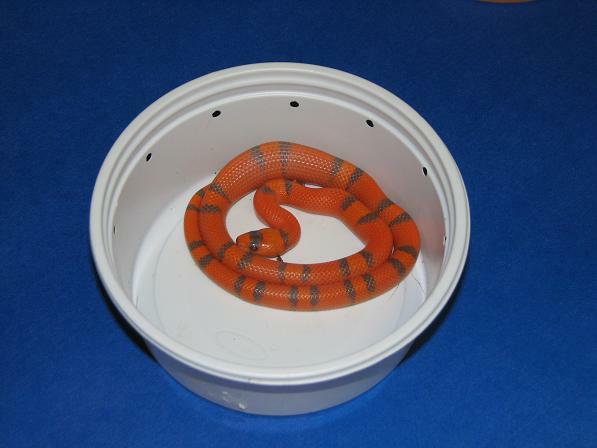 Choosing your snake – First, it should be emphasized that in all cases you should attempt to acquire a captive bred specimen. There are several reasons for this – first, captive bred animals are almost always healthier than their wild collected counterparts, being generally far less likely to have been exposed to such maladies as internal and external parasites and other diseases. Also, captive bred animals usually adapt more readily to being kept as pets. Finally, the plentiful availability of captive bred snakes reduces the necessity to collect wild specimens for the pet trade, thus relieving the pressure on the natural population. Your next choice will be whether to purchase an adult or hatchling snake. Although there are arguments to be made on both sides, it is generally better to start off with a hatchling for several reasons. First, there will be a wider variety to choose from. You will also know its age and, if buying directly from a breeder, its genetic background, which will be important if you intend to breed the animal in the future. You will be virtually assured that it has been captive bred, since very few hatchlings are wild collected. Finally, you will have the satisfaction of watching your snake grow and mature into an adult. Whether you are buying a hatchling or an adult, there are several items you should check to attempt to determine the animal’s health. Check that it appears alert and responsive as you handle it, making sure that it flicks its tongue in and out to check out its environment. Also check its body weight and muscle tone – it should not appear emaciated or have its ribs protruding, and should not have visible scars or “kinks” in its spine. Ask if it has been feeding regularly. Check its vent, called the cloaca, to make sure that it appears dry and closes properly. Try to listen to its breathing – if it appears to be wheezing or if mucous is present around the mouth, this may be a sign of respiratory infection. The mouth should close tightly and not display any scars or lesions. Finally, check the animal for the presence of any external parasites such as mites or ticks. · Substrate – Avoid cedar (toxic to reptiles) and sand or gravel (not absorbent, thus promoting bacterial growth). You could use something as simple as newspaper or paper towels, especially if you are looking to maximize efficiency of cleaning, or aspen or pine shavings. · Water – Clean water must be available at all times in a bowl that is heavy enough that the snake will not constantly tip it over. 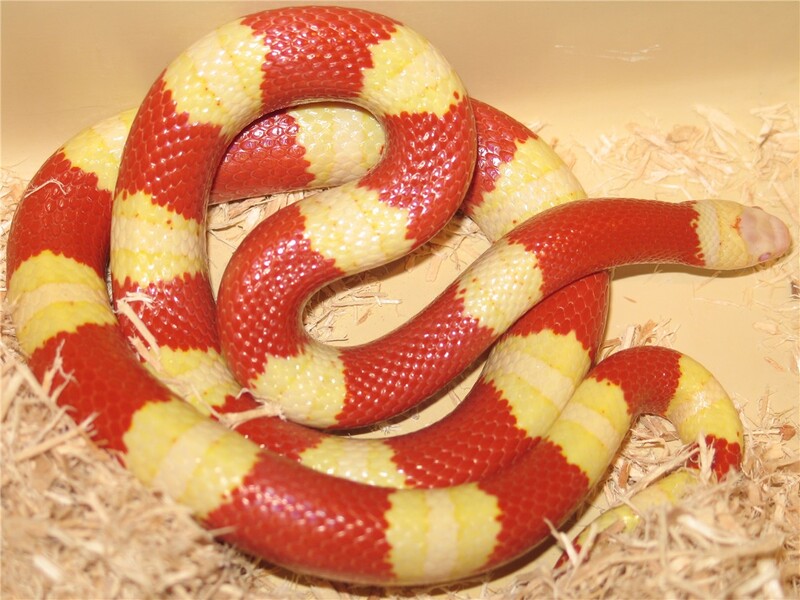 · Lighting – Since most kingsnakes and milk snakes are nocturnal, no special lighting setup is necessary. · Hiding – All snakes need a hiding spot to feel secure, which also replicates their natural behavior in the wild. A hiding spot can be fashioned from almost anything – plastic or rock caves purchased commercially, or small boxes with a hole cut out for access. The hiding place should be just large enough to allow the snake to fit in – remember, snakes are never claustrophobic, in fact they like being wedged into small snug places. Ideally, your cage would have two hide spots, one on the heated portion and one on the unheated side. This way, the snake does not have to choose between their natural inclination to hide and the need to thermoregulate. Feeding – Kingsnakes and milk snakes, like all snakes, are 100% carnivorous. Although there are several different food choices, there is no reason to feed captive corn snakes anything but rodents, mainly appropriately sized mice. For the most part, these snakes will accept frozen mice that have been completely thawed out. Although there is some discussion among hobbyists that feeding dead prey robs the snake of the opportunity to exercise by constricting the rodent, as they would in the wild, it is generally agreed that the advantages of feeding thawed food items outweigh the exercise foregone. Start hatchlings off by feeding pinkie mice. The best method for feeding hatchlings is to place the snake and the pinkie in a small deli cup, which forces the snake to concentrate on the food item. It should be noted that a small minority of hatchlings will insist on live prey initially, but even these can usually be switched over to pre-killed. As your snake matures, it will graduate to fuzzies, crawlers, and then small and ultimately adult mice. A general rule of thumb is to select a food item that does not exceed one and a half times the girth at the snake’s mid-body section. When feeding hatchlings in particular, exercise caution with respect to the size of the food item. Never feed a snake a prey item that is too large, because a hungry snake will often consume the animal only to subsequently regurgitate it. It is better to err on the side of caution – if you are not sure, feed two smaller items rather than one that may be too large. Once the snake has eaten, it will usually crawl off to the heated side of the cage and remain there for several days digesting the meal. Try not to handle the snake for 24 – 48 hours after they feed. Feeding schedules differ with respect to hatchlings and adults. For hatchlings, you can feed them as often as twice a week to as little as once every ten days. With adults, once every 7 to 14 days would be sufficient. If you are breeding your snakes, you probably want to feed the female more often in the weeks before breeding commences to prepare her for the rigors of laying eggs. 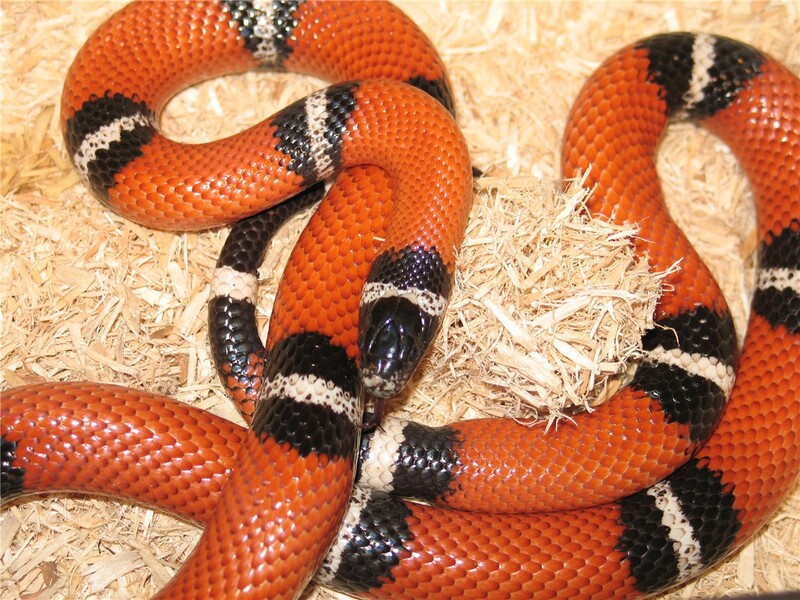 Breeding – Kingsnakes and milk snakes are among the easiest of snakes to breed in captivity. There are many varieties of these snakes available in the captive bred market, and if you choose this aspect of the hobby you can potentially accrue greater satisfaction from keeping your animals. A word of caution – before contemplating this step, make sure you are prepared and equipped to take care of the hatchlings that could result. Breeding snakes is an extensive subject not undertaken by the novice, and for more information we recommend acquiring one or more of the books listed below. Books to Read - This care sheet is by no means intended as a comprehensive guide to king snakes and milk snakes. For further information, read as much as can about these beautiful reptiles. We recommend the following comprehensive yet inexpensive books as a good starting point. The General Care and Maintenance of Milk Snakes by Robert Applegate, 1992. Advanced Vivarium Systems, Inc. The General Care and Maintenance of Common Kingsnakes by David Perlowin, 1992. Advanced Vivarium Systems, Inc. Milk Snakes by W. P. Mara, 1994. T.F.H. Publications. www.kingsnake.com - there are many care sheets available on this excellent web site. www.applegatereptiles.com - Robert Applegate is considered by many to be the foremost authority on kingsnakes and milk snakes. If you have additional questions about kingsnakes or milksnakes try to attend one of the LIHS monthly meetings. You can e-mail us at info@lihs.org or write or call the LIHS at the address/phone number at the top of this sheet. Reading about your pet before buying it is always beneficial.